The River Balcony is a proposed project spanning the full 1.5 miles of downtown Saint Paul’s Mississippi River bluff and including many civic landmarks and amenities. It is envisioned as a publicly accessible bluff-edge experience connecting public spaces and bluff-side redevelopment sites from Eagle Street and the Upper Landing Park along Kellogg Boulevard to Sibley and the Lower Landing Park. 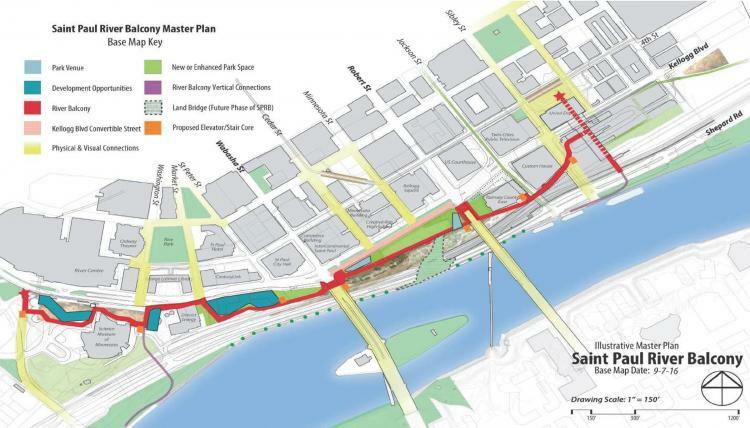 After the Great River Passage Master Plan was approved in 2013, the City of Saint Paul sought community input to develop a master plan for the River Balcony. The River Balcony Master Plan was adopted in 2017. Work to implement the River Balcony Master Plan is being conducted by the Great River Passage initiative. Visit the Great River Passage website for the latest information on this project and other work being done along the Mississippi River.